Arnoldo M. Gutierrez was born and raised in Del Rio, Texas, where he attended Sacred Heart Academy and Del Rio High School. His family relocated to SanAngelo in 1967 where upon he graduated from Central High School. Arnoldo was chosen by his peers to serve as the first president of the "Vocational Health Occupations" VICA class. During his high school years, he honed his musical abilities by participating in band, orquestra and eventually forming his own group. In order to afford his son the opportunity to achieve his dream of becoming an Eagle Scout, Arnoldo served first as a Cub Master and subsequently as a member of the Goodfellow AFB Troop 3 committee. The American Cancer Society allowed Mr. Gutierrez to serve as their treasurer for several years, affording him the opportunity to utilize his vast financial background. Arnoldo is an Angelo State University alumni graduating with a Bachelor of Arts degree. He furthered his education by attending San Antonio College receiving an Associate's Degree in Mortuary Science. Top Row, Standing from left to right: Sam Gaitan, Eddie Gutierrez, and Emilio Perez. 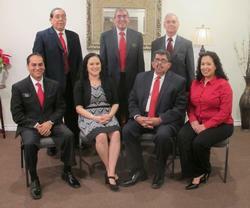 Bottom Row, Seated from left to right: Danny Musquiz, Valerie Stevens, Arnoldo M Gutierrez Sr., and Bianca Gutierrez. Not Pictured: Steve Hampton, Henry Deanda, and Teresa A. Torres.